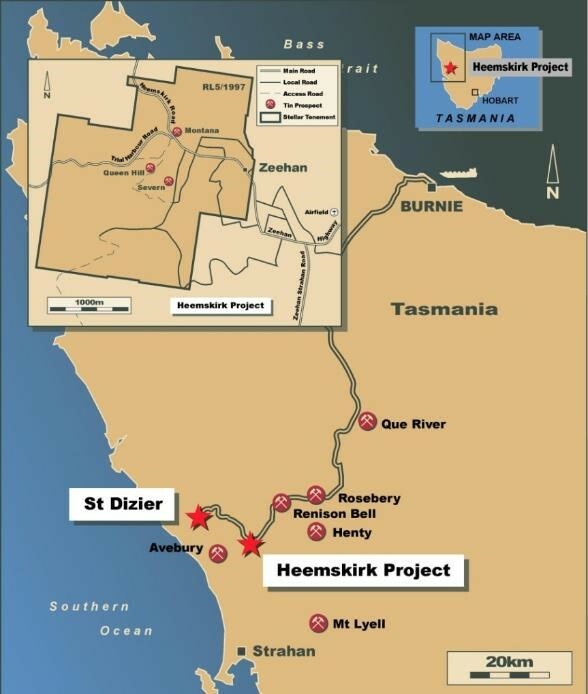 Stellar’s 100% owned, flagship Heemskirk Tin Project comprises three closely spaced tin deposits at Zeehan; Queen Hill, Severn and Montana (Zeehan tin deposits) and the St Dizier tin deposit 20km to the northwest of Zeehan. access to well established infrastructure, mining services and skilled mining people within the 100 year old mining district of northwest Tasmania. The project is located within 18km of Australia’s oldest and largest tin mine Renison Bell with both projects connected by an all-weather road. The Zeehan Mineral Resource of 6.35mt grading 1.13% Sn represents 72,000t of contained tin that will be mined from underground. Metallurgical test-work has confirmed that the ore can be treated in a flow sheet similar to that used at Renison Bell. The main advantage of the St Dizier deposit is that the upper part of the Indicated Mineral Resource of 1.2mt grading 0.69% Sn, or 8,250t of contained Sn, is amenable to open pit development. The JORC 2012 Mineral Resource estimates for the Zeehan and St Dizier tin deposits are summarised in the tables following. 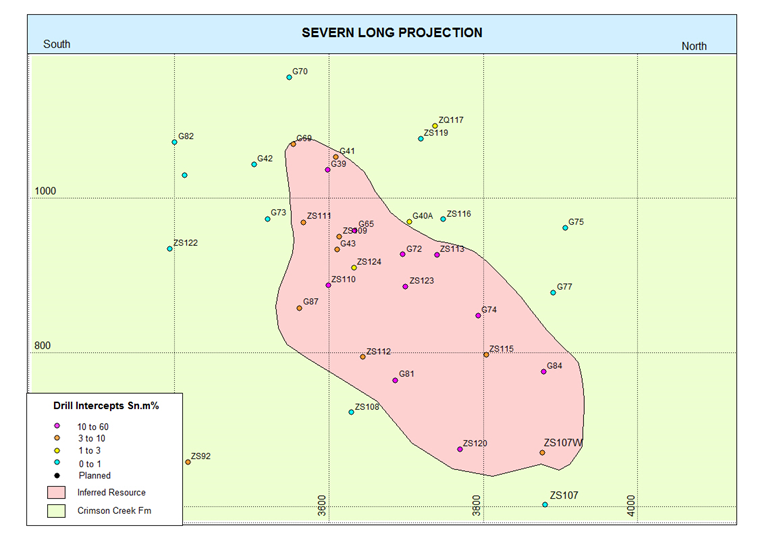 The global Indicated and Inferred Resource estimate for the Zeehan tin deposits is 6.35mt grading 1.13% total Sn. The Zeehan table identifies cassiterite as the dominant Sn mineral and includes grades of associated base metals to demonstrate geochemical differences between deposits. The JORC 2012 estimate, reported in 2016 is not materially different from the original estimate reported under JORC 2004 in 2013. However, it is a more robust estimate as it includes some additional drill holes and the results from mining, metallurgy and environmental studies. 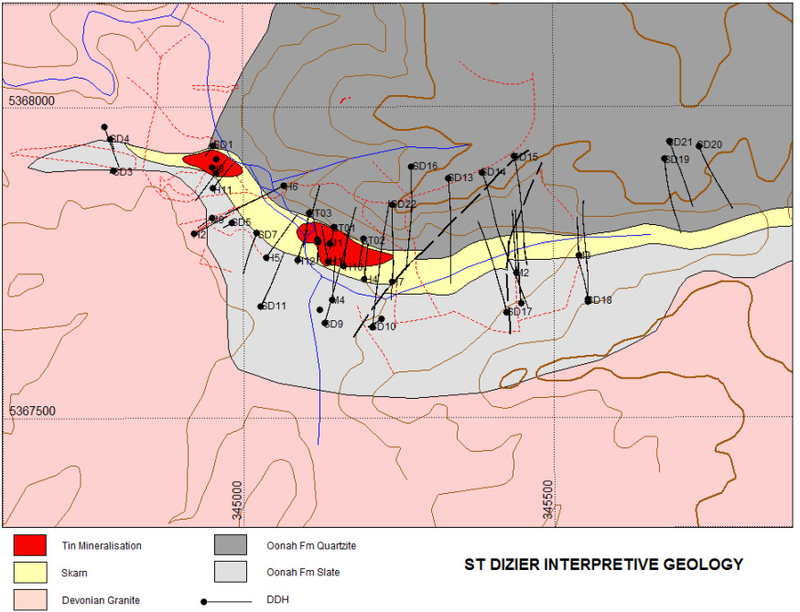 The global Indicated and Inferred Resource for St Dizier is estimated to be 2.26mt grading 0.61% total tin. The Indicated Mineral Resource is defined by a 50m x 50m drill spacing and cassiterite dominant tin mineralisation. This mineralisation is also closest to the surface. The Inferred Resource lies to the east of the Indicated Resource and occurs where the drill spacing is greater than 100m x 100m and tin occurs as a mixture of cassiterite and schoenfliesite. The Information that relates to Mineral Resources was prepared in accordance with the 2012 Edition of the “Australasian Code for Reporting of Exploration Results, Mineral Resources and Ore Reserves”(JORC Code), by Tim Callaghan, who is a Member of the Australasian Institute of Mining and Metallurgy (“AusIMM”), has a minimum of five years’ experience in the estimation, assessment and evaluation of Mineral Resources of this style and is a Competent Person as defined in the JORC Code. This announcement accurately summarises and fairly reports his estimations and he has consented to the resource report in the form and context in which it appears. 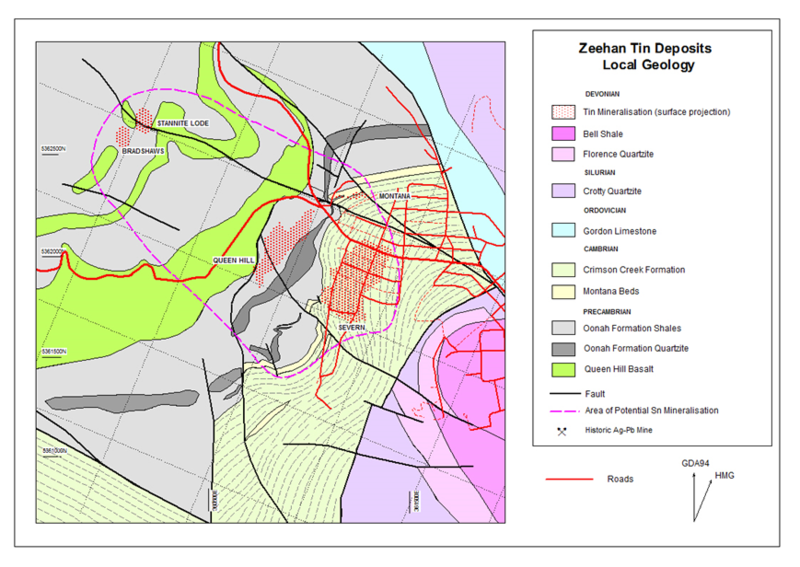 The Zeehan tin deposits, lie within RL5/1997 (retention licence) which is 100% owned by Stellar Resources Limited through its wholly owned subsidiary company Columbus Metals Limited. The RL is located on the western side of Zeehan, a historic mining town located in northwest Tasmania. Stellar Resources Limited has recently submitted a Mining Lease application over the RL to Mineral Resources Tasmania. The application is currently pending approval. The Zeehan Tin Deposits are Devonian Granite related cassiterite-pyrite-pyrrhotite-basemetal stockwork and replacement style mineralisation hosted in Proterozoic sediments and volcaniclastics of the Zeehan Sub Basin, Western Tasmania. The stratabound mineralisation is structurally controlled on fold/fault dilation zones between lithologies of contrasting rheology. Three steeply dipping and moderately plunging tabular deposits have been delineated over an area of 600m by 500m to 500m depth, the Severn, Queen Hill and Montana deposits. The Severn and Queen Hill deposits strike mine grid north-south, dip steeply east and plunge moderately north. The Montana deposit strikes east-northeast and has a steeply south to vertical dip. Mineralisation in all deposits remains open down plunge. Tin occurs principally as cassiterite with minor stannite and base-metal sulphides located towards the top and periphery of the Queen Hill and Montana Deposits. The Zeehan Tin Deposit Mineral Resource estimation is based on 100 historic diamond drill holes for 25,538m and 45 recent diamond drill holes for 13,720m. Mineralised intercepts range in core diameter with 58% NQ 47.6mm, 26% BQ 36.4mm and the remaining 16% larger sizes. Diamond core recoveries over mineralised zones averaged 98% for the Severn deposit, 96% for Queen Hill and 82% for Montana. Most historical and all recent drill-hole collars were surveyed by qualified surveyors. The first 28 drill holes had downhole surveys completed using acid tube and Tropari. The remainder had downhole surveys completed by Eastman single shot camera. Historical and recent geological logging of drill core is of high quality and completed by experienced geologists and field personnel. The Zeehan Tin Deposits are amenable to decline access, open stope mining methods with Drift and Fill and Avoca mining methods proposed where orebody dip requires. Rock fill, cemented rock fill and cemented aggregate fill were considered where appropriate. Mining studies were completed by MiningOne (2013 and 2016) and Polberro Consulting (2015). Tin recovery and concentrate grade assumptions are based on test-work conducted by ALS Metallurgy at its Burnie facility with supervision and interpretation of results by WorleyParsons. 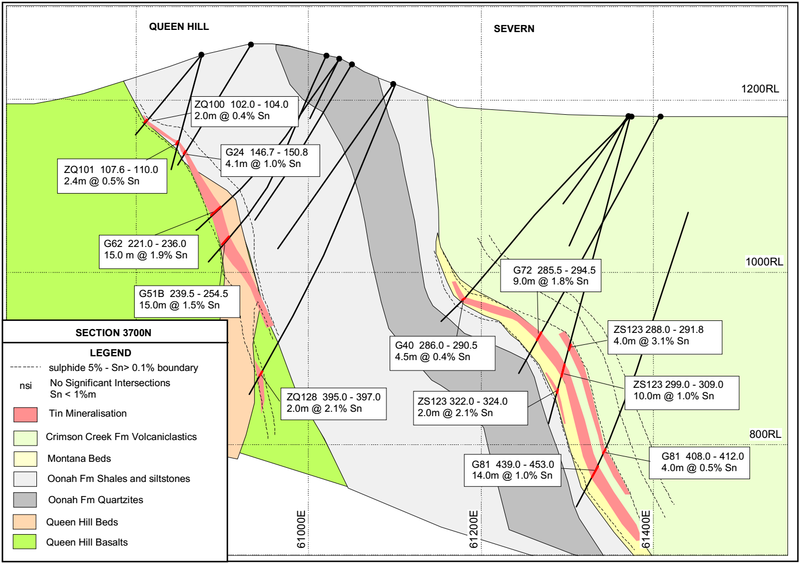 The most comprehensive test-work program was completed for the Severn deposit with partial testing of the flow sheet for the Queen Hill deposit. The St Dizier tin deposit lies within EL46/2003 (Heemskirk exploration licence) which is 100% owned by Stellar Resources Limited through its wholly owned subsidiary Rubicon Mintech Ventures Pty Ltd. The EL is located 20km to the northwest of Zeehan. The St Dizier deposit is a carbonate hosted metasomatic skarn in hornfelsed Precambrian sedimentary rocks on the northern edge of the Devonian Heemskirk Granite. The deposit forms a roof pendant located in a tight synformal trough on the surface of the granite. Hornfelsed quartzite forms the hangingwall to the skarn and hornfelsed slates the footwall. The skarn is vertically dipping, east-west striking stratabound body extending to a depth in excess of 200m from the surface. Mineralisation extends over a 400m strike length and varies between 3m and 40m in thickness. The skarn consists of magnetite-serpentinite-cassiterite-schoenfliesite-scheelite-bismuthinite. Tin mineralisation is zoned with dominantly cassiterite in the west and increasing amounts of schoenfliesite and other tin species to the east. 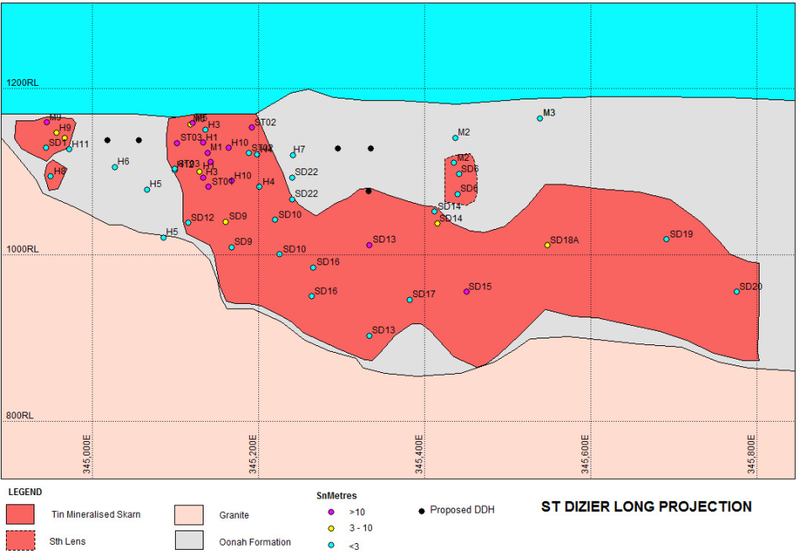 The St Dizier mineral resource estimate is based on 43 historic diamond drill holes for 7,309m over a number of campaigns by different operators and 3 confirmatory diamond drill holes for 317m drilled by Stellar. Scoping level engineering by Polberro Consulting has demonstrated that St Dizier can be developed as an open pit with ore processed in a central facility located at Zeehan. An initial pit could produce ore at a rate of 140,000 tpa for 3 years with an average head grade of 1.03% tin and a waste to ore ratio of 4.8. Scoping metallurgical testwork conducted on Stellar drill core by ALS Metallurgical and WorleyParsons showed that a final concentrate grading 50% tin could be produced with higher grade achievable with further dressing.